Roberta Ann (Regan) Randlett – in Woburn, January 20th, at seventy-six years of age. Beloved daughter of the late James and Mary Ellen (Scanlon) Regan. 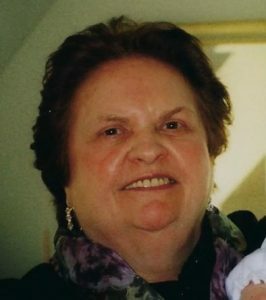 Devoted mother of Kathleen M. Randlett-Lally of Bradford, Christine M. Randlett, her husband Doug Pottle of Chelmsford and Jeanne M. Rainone, her husband Joe of Tewksbury. Dear sister of Mary Regan of W. Somerville and Edgartown and the late Francis X. Regan, his wife Nortrud Regan of Tewksbury. Loving “Nanny” of Michael Jr., his fiancé Michelle Moran, and Megan Lally, Nicholas and Jacqueline Pottle, Christian and Christina Rainone, along with a great grandchild, Aria Skye Lally. Cherished Aunt of James, John, Carolyn and Michael Regan. Relatives and friends are respectfully invited to Calling Hours at the Lynch–Cantillon Funeral Home, 263 Main St, Woburn, Saturday January 26th, from 9-10:30 a.m., followed by a Funeral Mass in St. Barbara Church, 138 Cambridge Road, Woburn at 11. Interment in Woodlawn Cemetery, 302 Elm St., Everett, MA 02149. Remembrances may be made in honor of Roberta to Catholic Charities, 275 West Broadway, Boston, MA 02127. For directions or to leave an online condolence, please visit www.Lynch-Cantillon.com or Facebook under Lynch-Cantillon Funeral Home. Roberta Ann (Regan) Randlett, passed away unexpectedly in her home on Sunday, January 20, 2019. The beloved daughter of the late James and Mary Ellen “Molly” (Scanlon) Regan, she was seventy-six years of age. Devoted mother of Kathleen M. Randlett-Lally of Bradford, Christine M. Randlett, her husband Doug Pottle of Chelmsford and Jeanne M. Rainone, her husband Joe of Tewksbury. Dear sister of Mary Regan of W. Somerville and Edgartown and the late Francis X. Regan, his wife Nortrud Regan of Tewksbury. Loving “Nanny” of Michael Jr., his fiancé Michelle Moran, and Megan Lally, Nicholas and Jacqueline Pottle, Christian and Christina Rainone, along with a great grandchild, Aria Skye Lally. Cherished Aunt of James, John, Carolyn and Michael Regan. Born in Cambridge, she was one of three children raised in Somerville and educated in Somerville and Boston. All throughout her life, she was very committed to her faith, which included attending Catholic schools. She graduated from Cardinal Cushing High School. Roberta retired from what is now Eversource (formerly NSTAR) as a clerk where she remained for many years. Although, the most important job that she had was raising her three daughters. She loved her home and was grateful for her many dear friends and neighbors. Roberta’s faith sustained her throughout her lifetime, and she stayed steadfast to her faith and beliefs. She found great peace and comfort in being a part of spiritual prayer groups with her dear friends. She also had a great love for music. Her mother was a gifted self-taught piano player, and as a young child, Roberta participated in many shows. Musical talent has continued within the family right down to her grandchildren. She was an extremely proud “Nanny” to all of them. Nothing was more important to her than her family. She cherished the many special times they shared. Relatives and friends are respectfully invited to Calling Hours at the Lynch–Cantillon Funeral Home, 263 Main St, Woburn, Saturday January 26th, from 9-10:30 a.m., followed by a Funeral Mass in St. Barbara Church, 138 Cambridge Road, Woburn at 11. Interment in Woodlawn Cemetery, 302 Elm St., Everett, MA 02149. Remembrances may be made in honor of Roberta to Catholic Charities, 35 Bird Street, Boston, MA 02125. For directions or to leave an online condolence, please visit www.Lynch-Cantillon.com or Facebook under Lynch-Cantillon Funeral Home. Relatives and friends are respectfully invited to Calling Hours at the Lynch–Cantillon Funeral Home, 263 Main St, Woburn, Saturday January 26th, from 9-10:30 a.m., followed by a Funeral Mass in St. Barbara Church, 138 Cambridge Road, Woburn at 11. Interment in Woodlawn Cemetery, 302 Elm St., Everett, MA 02149. Remembrances may be made in honor of Roberta to Catholic Charities, 275 West Broadway, South Boston , MA 02127 . For directions or to leave an online condolence, please visit www.Lynch-Cantillon.com or Facebook under Lynch-Cantillon Funeral Home. My deepest condolences, it was an honor to know your kind, caring Mother. To the family of Roberta, know that she was a dedicated worker & union sister at the gas company. I enjoyed many laughs with Roberta, especially her exasperation as the technology boom came roaring through the company. She was a wonderful woman who has been missed since the day she retired.